The Matrix Reloaded is a 2003 science fiction action film written and directed by The Wachowskis. [a] It is the first sequel to The Matrix, and the second installment in The Matrix trilogy. Reloaded premiered on May 7, 2003, in Westwood, Los Angeles, California, and went on general release by Warner Bros. in North American theaters on May 15, 2003, and around the world during the latter half of that month. It was also screened out of competition at the 2003 Cannes Film Festival. The video game Enter the Matrix, which was released on May 15, and a collection of nine animated shorts, The Animatrix, which was released on June 3, supported and expanded the storyline of the film. The film received generally positive reviews from critics and grossed $742.1 million worldwide. The Matrix Revolutions, which completes the story, was released six months after Reloaded, in November 2003. Six months after the events of the first film, Neo (Keanu Reeves) and Trinity (Carrie-Anne Moss) are now romantically involved. Morpheus (Laurence Fishburne) receives a message from Captain Niobe (Jada Pinkett Smith) of the Logos calling an emergency meeting of all of Zion's ships. Zion has confirmed the last transmission of the Osiris: an army of Sentinels is tunneling towards Zion and will reach it within 72 hours. Commander Lock (Harry Lennix) orders all ships to return to Zion to prepare for the onslaught, but Morpheus asks one ship to remain in order to contact the Oracle (Gloria Foster). The Caduceus receives a message from the Oracle, and the Nebuchadnezzar ventures out so Neo can contact her. One of the Caduceus crew, Bane (Ian Bliss), encounters Agent Smith (Hugo Weaving), who absorbs his avatar whilst killing him in the process. Smith then uses this avatar to leave the Matrix, gaining control of Bane's real body. In Zion, Morpheus announces the news of the advancing machines to the people. Neo receives a message from the Oracle and returns to the Matrix to meet her bodyguard Seraph (Collin Chou), who then leads him to her. After realizing that the Oracle is part of the Matrix, Neo asks how he can trust her; she replies that it is his decision. The Oracle instructs Neo to reach the Source of the Matrix with the help of the Keymaker (Randall Duk Kim), a prisoner of the Merovingian (Lambert Wilson). As the Oracle departs, Smith appears, telling Neo that after being defeated, he refused to be deleted, and is now a rogue program. He demonstrates his ability to clone himself using other inhabitants of the Matrix, including other Agents, as hosts. He then tries to absorb Neo as a host, but fails, prompting a battle between Smith's clones and Neo. Neo manages to defend himself, but is forced to retreat from the increasingly overwhelming numbers. Neo, Morpheus, and Trinity visit the Merovingian and ask for the Keymaker, but the Merovingian refuses. His wife Persephone (Monica Bellucci), seeking revenge on her husband for his infidelity, betrays him and leads the trio to the Keymaker. The Merovingian soon arrives with his men. Morpheus, Trinity, and the Keymaker escape, while Neo holds off the Merovingian's servants. Morpheus and Trinity try to escape with the Keymaker on the freeway, facing several Agents and the Twins, the Merovingian's chief henchmen. Morpheus defeats the Twins, Trinity escapes, and Neo flies in to save Morpheus and the Keymaker from Agent Johnson. In the real world, Zion's remaining ships prepare to battle the machines. Within the Matrix, the crews of the Nebuchadnezzar, Vigilant and Logos help the Keymaker and Neo reach the door to the Source. The crew of the Logos must destroy a power plant in the Matrix to prevent a security system from being triggered, and the crew of the Vigilant must destroy a back-up power station. The Logos succeeds, while the Vigilant is bombed by a Sentinel in the real world, killing everyone on board. Although Neo asked Trinity to remain on the Nebuchadnezzar due to getting a premonition of her death, she enters the Matrix to replace the Vigilant crew and complete their mission. However, her escape is compromised by Agent Thompson, and they fight. As Neo, Morpheus, and the Keymaker try to reach the Source, the Smiths appear and attack them. The Keymaker unlocks the door to the Source, allowing Neo and Morpheus to enter and escape from the Smiths, but the Smiths shoot the Keymaker dead while he tries to close the door to the Source. Neo enters a door and meets a program called the Architect, the creator of the Matrix. The Architect explains that Neo is an intentional part of the design of the sixth iteration of Matrix, designed to combine the anomalies and stop the fatal system crash that naturally occurs due to the concept of human choice. As with the five previous Ones, Neo can choose either to return to the Source with his unique code to reboot the Matrix and pick survivors to begin to repopulate the soon-to-be-destroyed Zion, or cause the Matrix to crash and kill everyone connected to it; combined with Zion's destruction, this would mean mankind's extinction. Neo learns of Trinity's situation and chooses to save her instead of returning to the Source. As she falls off a building, getting shot in the process, Neo flies in and catches her. He then phases his hand into Trinity’s body and removes a bullet from her body, restarts her heart and revives her from death. They return to the real world and are attacked by Sentinels. The Nebuchadnezzar gets destroyed, but the crew escape. Neo displays a new ability to disable the machines with his thoughts, but falls into a coma from the effort. The crew are picked up by another ship, the Hammer. Its captain, Roland, reveals the other ships were wiped out by the machines after someone activated an EMP too early, and that they found only one survivor afterwards—revealed to be the Smith-possessed Bane. Zee was originally played by Aaliyah, who died in a plane crash on August 25, 2001, before filming was complete, requiring her scenes to be reshot with actress Nona Gaye. The Matrix Reloaded was largely filmed at Fox Studios in Australia, filming began on March 1, 2001 and ended on August 21st, 2002, concurrently with filming of the sequel, Revolutions. The freeway chase and "Burly Brawl" scenes were filmed at the decommissioned Naval Air Station Alameda in Alameda, California. The producers constructed a 1.5-mile freeway on the old runways specifically for the film. Some portions of the chase were also filmed in Oakland, California, and the tunnel shown briefly is the Webster Tube, which connects Oakland and Alameda. Some post-production editing was also done in old aircraft hangars on the base as well. The city of Akron, Ohio was willing to give full access to Route 59, the stretch of freeway known as the "Innerbelt", for filming of the freeway chase when it was under consideration. However, producers decided against this as "the time to reset all the cars in their start position would take too long". MythBusters would later reuse the Alameda location in order to explore the effects of a head-on collision between two semi trucks, and to perform various other experiments. Around 97% of the materials from the sets of the film were recycled after production was completed; for example, tons of wood were sent to Mexico to build low-income housing. Some scenes from the film Baraka by Ron Fricke were selected to represent the real world shown by the wallmonitors in the Architect's room. The scene where The Oracle (Gloria Foster) appears was filmed before her death on September 29, 2001. Following the success of the previous film, the Wachowskis came up with extremely difficult action sequences, such as the Burly Brawl, a scene in which Neo had to fight 100 Agent Smiths. To develop technologies for the film, Warner Bros. launched ESC Entertainment. The ESC team tried to figure out how to bring the Wachowskis' vision to the screen, but because bullet time required arrays of carefully aligned cameras and months of planning, even for a brief scene featuring two or three actors, a scene like the Burly Brawl seemed almost impossible as envisioned and could take years to composite. Eventually John Gaeta realized that the technology he and his crew had developed for The Matrix's bullet time was no longer sufficient and concluded they needed a virtual camera (in other words, a simulation of a camera). Having before used real photographs of buildings as texture for 3D models in The Matrix, the team started digitizing all data, such as scenes, characters' motions, or even the reflectivity of Neo's cassock. The reflectivity of objects needs to be captured and simulated adequately and Paul Debevec et al. captured the reflectance of the human face and Borshukov's work was strongly based on the findings of Debevec et al. They developed "Universal Capture", a process which samples and stores facial details and expressions at high resolution, then capture expressions from Reeves and Weaving using dense aka. markerless capture and multi-camera setup (similar to the bullet time rig) photogrammetric capture technique called optical flow. The algorithm for Universal Capture was written by George Borshukov, visual effects lead at ESC, who had also created the photo-realistic buildings for the visual effects in The Matrix. With this collected wealth of data and the right algorithms, they finally were able to create virtual cinematography in which characters, locations, and events can all be created digitally and viewed through virtual cameras, eliminating the restrictions of real cameras, years of compositing data, and replacing the use of still camera arrays or, in some scenes, cameras altogether. The ESC team render the final effects using the program mental ray. Don Davis, who composed for The Matrix, returned to score Reloaded. For many of the pivotal action sequences, such as the "Burly Brawl", he collaborated with Juno Reactor. Some of the collaborative cues by Davis and Juno Reactor are extensions of material by Juno Reactor; for example, a version of "Komit" featuring Davis' strings is used during a flying sequence, and "Burly Brawl" is essentially a combination of Davis' unused "Multiple Replication" and a piece similar to Juno Reactor's "Masters of the Universe". One of the collaborations, "Mona Lisa Overdrive", is titled in reference to the cyberpunk novel of the same name by William Gibson, a major influence on the directors. Leitmotifs established in The Matrix return — such as the Matrix main theme, Neo and Trinity's love theme, the Sentinel's theme, Neo's flying theme, and a more frequent use of the four-note Agent Smith theme — and others used in Revolutions are established. As with its predecessor, many tracks by external musicians are featured in the movie, its closing credits, and the soundtrack album, some of which were written for the film. Many of the musicians featured, for example Rob Zombie, Rage Against the Machine and Marilyn Manson, had also appeared on the soundtrack for The Matrix. Rob Dougan also re-contributed, licensing the instrumental version of "Furious Angels", as well as being commissioned to provide an original track, ultimately scoring the battle in the Merovingian's chateau. A remixed version of "Slap It" by electronic artist Fluke — listed on the soundtrack as "Zion" — was used during the rave scene. Linkin Park contributed their instrumental song "Session" to the film as well, although it did not appear during the course of the film. P.O.D. composed a song called "Sleeping Awake", with a music video which focused heavily on Neo, as well as many images that were part of the film. Both songs played during the film's credits. It was originally planned for the electronic band Röyksopp to create the soundtrack, but this offer was turned down. The film earned an estimated $5 million during Wednesday night previews in North America. Reloaded grossed $37.5 million on its Thursday opening day in North America from 3,603 theaters, which was the second highest opening day after Spider-Man's $39.4 million and highest for a Thursday. The film earned $91.7 million in its first weekend, and ultimately grossed $281.5 million in the US, and $742.1 million worldwide. The film sold an estimated 46,695,900 tickets in North America. Reloaded received a Rotten Tomatoes approval rating of 73%, based on 244 reviews, with a weighted average score of 6.8/10. The site's critical consensus states: "Though its heady themes are a departure from its predecessor, The Matrix Reloaded is a worthy sequel packed with popcorn-friendly thrills." The film's rating on Metacritic is 62%, based on reviews from 40 critics, indicating "generally favorable reviews". However, Entertainment Weekly named it as one of "The 25 Worst Sequels Ever Made". Positive comments from critics included commendation for the quality and intensity of its action sequences, and its intelligence. Tony Toscano of Talking Pictures had high praise for the film, saying that "its character development and writing...is so crisp it crackles on the screen" and that "Matrix Reloaded re-establishes the genre and even raises the bar a notch or two" above the first film, The Matrix. Negative comments included the sentiment that the plot was alienating, with some critics regarding the focus on the action as a detriment to the film's human elements. Some critics thought that the number of scenes with expository dialog worked against the film, and the many unresolved subplots, as well as the cliffhanger ending, were also criticized. Other criticisms included the film's perceived lack of pacing. The film was initially banned in Egypt because of the violent content and because it put into question issues about human creation, "which are related to the three divine religions." The Matrix Reloaded was released on VHS and DVD on October 14, 2003. A Blu-Ray release followed on September 7, 2010. The Matrix Reloaded was released as a part of The Matrix Trilogy on 4K UHD Blu-ray on October 30, 2018. ^ "Film Distribution". Village Roadshow. Archived from the original on February 25, 2014. Retrieved February 11, 2014. ^ "The Matrix Reloaded". British Board of Film Classification. Retrieved September 15, 2013. ^ "The Matrix Reloaded (2003)". LUMIERE. Retrieved November 22, 2017. ^ "The Matrix Reloaded (2003)". British Film Institute. Retrieved December 16, 2014. ^ "The Matrix Reloaded (2003) - Andy Wachowski, Larry Wachowski - Synopsis, Characteristics, Moods, Themes and Related". AllMovie. Retrieved October 8, 2017. ^ a b "The Matrix Reloaded (2003)". Box Office Mojo. Retrieved February 5, 2009. ^ "Festival de Cannes: The Matrix Reloaded". festival-cannes.com. Retrieved November 10, 2009. ^ "Aaliyah". The Independent. London. August 27, 2001. Archived from the original on June 6, 2010. ^ "Aaliyah: A 'beautiful person's' life cut short". Archives.cnn.com. August 27, 2001. Retrieved February 8, 2015. ^ Job, Ann. "Chasing the Stars: Carmakers in Movies". MSN.com. Retrieved January 30, 2005. ^ "Hollywood smog an inconvenient truth". Associated Press (CNN.com). November 14, 2006. Archived from the original on December 15, 2006. ^ a b Silberman, Steve. "Matrix2". Wired. Retrieved December 25, 2012. ^ Debevec, Paul; J. P. Lewis (2005). "Realistic human face rendering for "The Matrix Reloaded"". ACM. doi:10.1145/1198555.1198593. Retrieved August 10, 2013. ^ "Weekend Box Office Results for May 16-18, 2003 - Box Office Mojo". Boxofficemojo.com. Retrieved October 8, 2017. ^ "The Matrix Reloaded (2003)". Box Office Mojo. Retrieved July 13, 2016. ^ "The Matrix Reloaded (2003)". Rotten Tomatoes. Fandango. Retrieved April 24, 2018. ^ "The Matrix Reloaded Reviews". Metacritic. CBS Interactive. Retrieved July 9, 2016. ^ Nashawaty, Chris (December 22, 2007). "The 25 Worst Sequels Ever Made". Entertainment Weekly. Retrieved July 9, 2016. ^ McCarthy, Todd (May 7, 2003). "The Matrix Reloaded". Variety. Retrieved July 12, 2007. ^ Arnold, William (May 14, 2003). "'Matrix' fans can't afford to miss 'Reloaded'". Seattlepi.com. Retrieved July 12, 2007. ^ Toscano, Tony (May 20, 2003). "The Matrix Reloaded (2003) movie review". Rotten Tomatoes. Archived from the original on March 10, 2007. Retrieved July 12, 2007. ^ Schickel, Richard (May 11, 2003). "The Matrix Reboots". TIME. Retrieved July 12, 2007. ^ Rodriguez, Rene (May 14, 2003). "Sequelitis infects 'Matrix Reloaded' with talk - lots of it". Miamiherald.com. Archived from the original on August 12, 2003. Retrieved July 12, 2007. ^ Sterritt, David (May 16, 2003). "Ready for a Neo world order?". csmonitor.com. Retrieved July 12, 2007. ^ Rabin, Nathan (May 13, 2003). "The Matrix Reloaded review". The A.V. Club. Retrieved July 12, 2007. ^ Miller, Skyler. "The Matrix Reloaded review". AllMovie. Retrieved July 9, 2016. ^ Savlov, Marc (May 16, 2003). "The Matrix Reloaded review". The Austin Chronicle. Retrieved July 12, 2007. ^ Caro, Mark (June 11, 2003). "Movie review: 'The Matrix Reloaded'". Metromix. Archived from the original on December 30, 2007. Retrieved July 12, 2007. ^ Sailer, Steve (May 15, 2003). 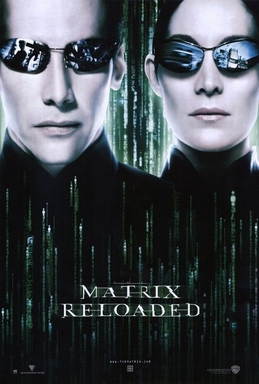 "Film of the Week: 'Matrix Reloaded'". UPI. Retrieved October 6, 2015. It has only two speeds: you either get leaden philosophizing about free will or super-colossal action set pieces. It's like "My Dinner with Andre on the Hindenburg." ^ "Egypt bans 'too religious' Matrix". BBC News. June 11, 2003. Retrieved August 21, 2016. ^ "The Matrix Reloaded DVD Release Date October 14, 2003". DVDs Release Dates. Retrieved May 21, 2018. ^ "The Matrix Trilogy - 4K Ultra HD Blu-ray Ultra HD Review | High Def Digest". ultrahd.highdefdigest.com. Retrieved November 26, 2018.